In this post I will tell you, how you can listen YouTube songs without touching your web browser. Suppose you were working on something and you want to listen some songs while working but currently you don’t have those songs (you want to listen) in your PC. And for sure shot you will get it on YouTube but each time you have to go to YouTube, search for the song and then play it. So here is the simple solution, you can use Quisple. It will help you in listen any songs directly from YouTube. Download Quisple and install it in your PC (you might need .NET Framework, if it is not installed in your PC) after you have installed the Quisple. Open it and type song name which ever song you want to listen, it will search on YouTube and play the 1st result from the search results. The down side is it doesn’t convert the YouTube video into audio file, it stream the video from the YouTube and hide the video part it and only plays the audio. If you have a slow internet connection and you face problem in viewing the YouTube videos while streaming then Quisple might be a bad idea to use. Quisple makes a playlist of the last 10 (default you can change it) songs you have listen. It also have the Always on Top option in settings. To change the settings click on i at the bottom-right corner of the player. If you want to see the video of the currently playing song click on the YouTube icon at the bottom-left corner of the player it will open the window in your default web browser. In this post I am going to tell you how you can convert any printable file to PDF file. To convert any printable fine in PDF, 1st might you need to download two softwares (CutePDF and GPL Ghostscript). 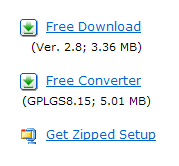 To download go to the download page by Clicking here, there in left column you will see 3 icons (as shown in below image). After downloading the software, install it in your computer. Now open the file which you want to convert it into PDF and print that file or press Ctrl + P (shortcut key for printing). Now select the CutePDF Writer icon and click on Print.